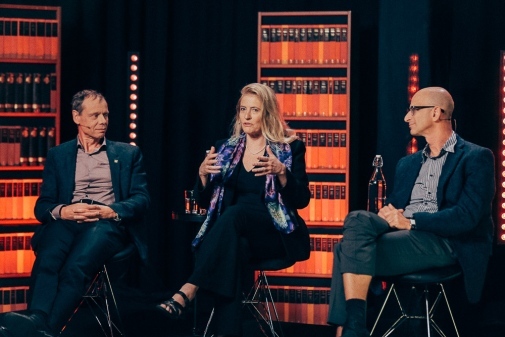 The new space age was in focus when top researchers from Stockholm University and KTH participated in the latest episode of the academic talk show Crosstalks. What are the next milestones in understanding the universe and our place in it, and how can today’s technology support this research, were questions discussed by the panel. Researchers participating in the show were Christer Fuglesang, ESA astronaut, Adjunct Professor in Space Physics and Director of KTH Space Center at KTH Royal Institute of Technology, Katherine Freese, a Theoretical Astrophysicist and Professor of Physics at Stockholm University and Director of the Nordic Institute for Theoretical Physics (Nordita), Ariel Goobar, Professor of Experimental Particle Astrophysics at Stockholm University, and Kim Stanley Robinson, Bestselling American science fiction writer and author of the Mars trilogy. “A large fraction of the universe, seventy percent, is made up of something that does not at all behave like we expect it to do. It is actually doing the opposite. This is a part that we understand very poorly, and we call it dark energy”, Professor Ariel Goobar continued. The panel also discussed how we can explore the universe using the technology and theoretical frameworks emerging today? How do hands on research into spaceflight interact with theoretical physics? And what are the next milestones in understanding the universe and our place in it? “We can put experiments in space and we need people up there to run them. One example is the Hubble Space Telescope where we sent astronauts several times to service it. More philosophically, just being able to send people to space increases our interest in space and pushes us to go further in the quest for the origin of life. How did it start? Where can it appear?” Christer Fuglesang, ESA astronaut who has been on two space trips, said. "In the 1990’s we understood that the universe is accelerating. First later did we have the technology we needed to show this. We need to collaborate, we can only make discoveries when technology allows us to. Technology can do that now, it is exciting", Professor Goobar said. Talking about fiction’s relationship to science, author Kim Stanley Robinson, who joined the conversation via Skype, mentioned: “Research for my books is a fun part of my work. I get to understand how scientists work. It all comes together on a need to know basis, and a lot of it comes to down rhetorical tricks, I can do the style of a scientist”. On the topic of science fiction, Ariel Goobar commented the role of science: “As a researcher, I do not create things, I try to find them”. Astrophysics, astronomy and cosmology are also coming closer to each other thanks to more and more cross-scientific work. Talking about the future, Christer Fuglesang said “"I think that we eventually will go to other stars. It will maybe take a few generations to go there, but we will be able to do it, and maybe even create space cities. In ten thousand years, which is short discussing space”. “We will go to Mars, but back to the moon first, to practice”, he added. The panel ended the talk by mentioning that they all believe there is life in space. 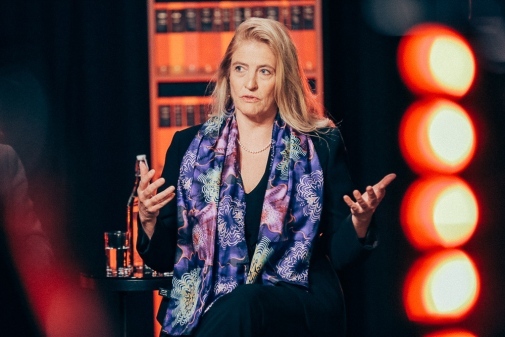 "Obviously there is life out there, there is life in our galaxy, and even intelligent life out there", Katherine Freese said. "The statistics certainly suggests that there should be life elsewhere. That we have not found life elsewhere suggests that we should cherish what we have, it is very fragile, and no one else has yet found it", Ariel Goobar concluded at the end of the show. 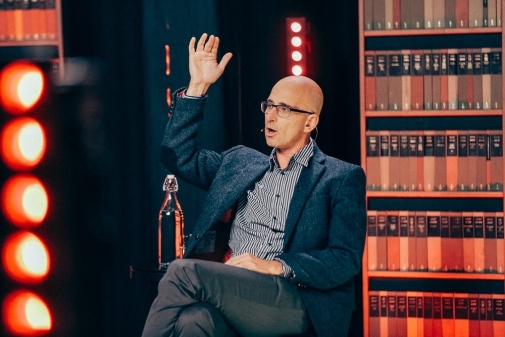 Crosstalks is an international academic talk show, broadcast once a month by two of Sweden’s top universities – KTH Royal Institute of Technology and Stockholm University. All episodes are available online here. What does design say about human nature and social structures? 2016-10-07 The design of objects around us affects us in profound ways and humans are drawn to beauty. How do appearances and surfaces affect user experience? How does the digital world change the way we interact with physical objects and spaces, and what does the future look like? How can we live forever? 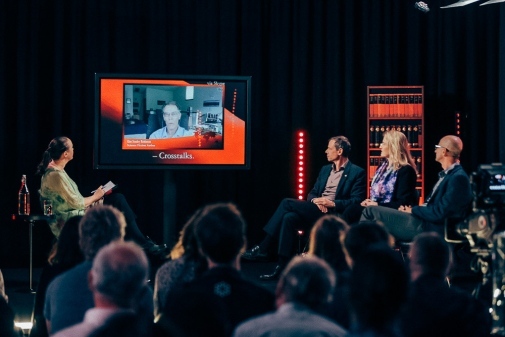 2015-09-01 The dilemma of human enhancement, and the dangers and pitfalls of using science to enable us to live forever, was discussed in the latest episode of the academic talk show Crosstalks. Collaboration is key when dealing with the forest 2015-07-15 The forests hold many keys to a more sustainable society. Cross-disciplinary education and collaboration are essential to address the complex issues forest management brings about. Artificial intelligence is not a threat 2015-05-26 Recreation of human abilities, rise of intelligent machines and development of new technologies. Artificial intelligence was in focus in the last episode of the academic talk show Crosstalks, now available at crosstalks.tv.